It has been almost 80 years ago in the 1930's when comedians Bud Abbott and Lou Costello developed one of the greatest comedy routines in the history of this nation: "Who's On first?" 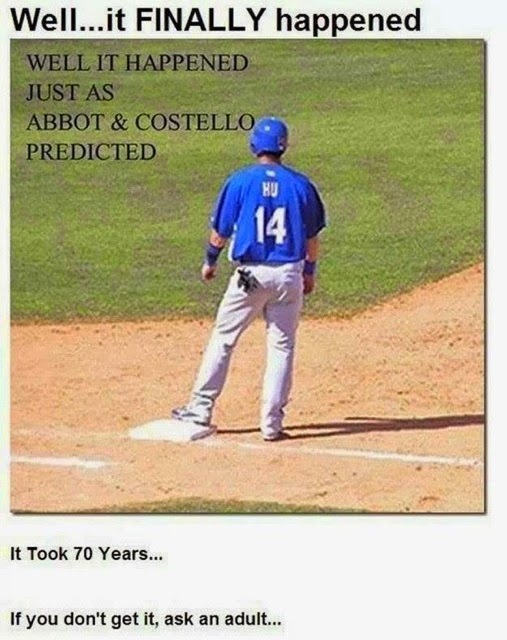 Who knew that Abbott and Costello could be so prescient....well it only took almost 80 years but we finally find out that who or should I say Hu, is really on first. Well, he is on first but Chin-Lung Hu actually plays second base for the Cleveland Indians [update: he has just been released by the Indians and is now a free agent]. The only question is, how many years will we find out that what really is on second? I don't know---THIRD BASE! Well, for those too young to have seen this great routine, here it is one more time. Abbott and Costello: "Who's On First?" Thanks big Stephen...I just have given you the hat tip in the introduction. You the man! or is that Hu the man! At 1930 years now we count then It will be approximately 80 years of the life from the comedians that are no more with us. First comedian of the comedy drama was hero and he was to essay writing uk fan when first words of the comedy he spoke. Comedy forgot all the sadness it come happiness in our face after listen the comedy. It was introduce the 1980 in buy an essay online the best comedian on those days was the bud abort it is really a fine comedian.